One of those unsolicited emails that comes along every so often whose sole purpose, or so it seems, is simply to annoy you. First of all, your inconsistency with your your and your you're is too much to bear. You don't actually explain anything. All you do is repeat the headline. Two products that allows...? Comma instead of a full stop? Its so simple? 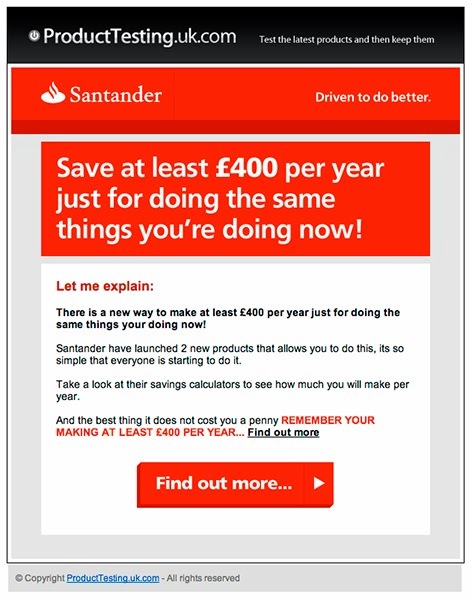 Your (or, as you would say, you're) client, Santander: Driven to do better? Driven to distraction, more like.